Tonight there is a full moon - the best time for spellcraft. Most witches cast a circle as a safe and sacred space within which to work magic - to contain any magical energy raised and to keep out unwanted influences. Many books on witchcraft will give details on how to cast a circle, but the directions given can often seem longwinded and a bit complicated, involving going around the circle several times, calling in the different elements - earth, air, fire and water - and addressing the points of the compass. Sometimes - especially on a week night - you might not have time to go through all that palaver. If you want to cast a basic circle to perform a simple spell, here is a way you can do it using just a candle. While you do that, visualise the light of the candle flame creating an invisible circle all around you as well as above and below you. You can then put the candle down on the floor in the centre of your circle (or on your altar if you use an altar) and cast whatever spell you have planned. At the end of the rite, walk anticlockwise around the circle with the candle and say: "The circle is open, the elements may depart, the rite is done." Then snuff out the candle. The reason why this method of circle casting works so well despite being simple is that a candle represents all the elements. Obviously the flame represents fire. 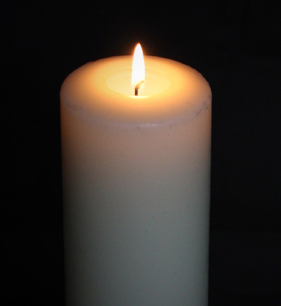 The solid wax body of the candle represents earth and the liquid, melted wax represents water. The smoke and shimmering air around the flame represent air. The light is also a wonderful representation of the fifth element - spirit. The word "encompass" obviously means to surround and hold within, but it also has an archaic meaning of "to cause to take place". In the circle casting rhyme it means that we want the candle light to help form our protective circle, but also to empower the magic to be performed within it. You can find out more ways of using candles for spells and witchcraft rites in my book Pagan Portals - Candle Magic.